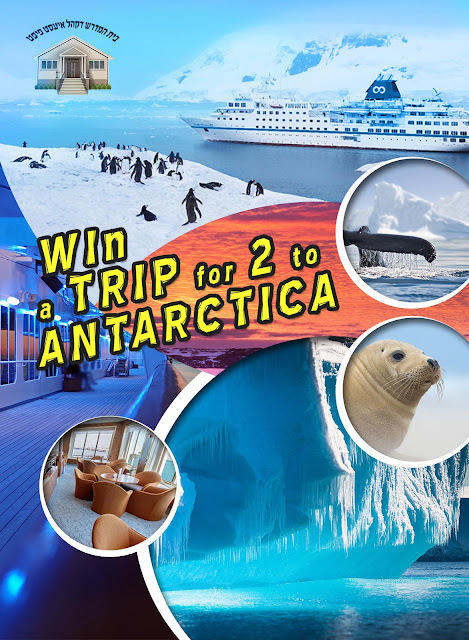 Win A Kosher Cruise Aboard The Journey Of A Life Time To Antarctica and $3,500! Khal East 5th of Lakewood NJ is a warm and friendly neighborhood Shul, that welcomes everyone that comes through the door. Your raffle entry will help us with our building campaign to help us move in to our permanent building. • Tickets for 2 passengers to cruise in a private superior cabin from Argentina to Antarctica. Note that the winner will have to purchase their own airfare to Ushuaia, Argentina. The $3,500 cash portion of the prize will help with the airfare expense. You can read all the details about the trip on the kosher cruise website at KosherAntarctica.com and you can find trip details and dates here. P.S. Winner will have 12 hours from time of drawing to submit names of the passengers.